Rotary paper trimmers enhance paper cutting safety with concealed blades and they deliver more cutting flexibility. They are used to cut and trim paper, cardboard, plastic, poster board and material that is longer in length and/or requires greater accuracy. Rotary paper trimmers are the perfect choice for graphic designers, reprograhic houses, photographers and anyone looking for a combination of convenience, accuracy and safety. We can supply a full range of replacement heads and parts for most products listed below. Solid A4 rotary trimmer ideal for Office or School use. 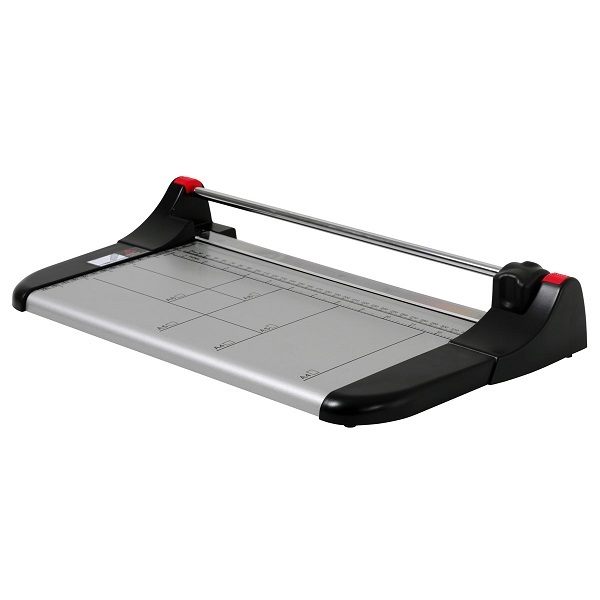 Durable metal cutting table with clear paper clamp. Paper guides for easy cutting of popular formats. Cutting head can be replaced. Cutting Capacity - up to 10 sheets of A4-size paper. Solid A3 rotary trimmer ideal for Office or School use. Cutting Capacity - up to 10 sheets of A3-size paper. Versatile A4 rotary trimmer, suitable for both office and craft applications. It has an ergonomically designed grip guard that is comfortable and easy to use. Lightweight with strong metal base complete with metric graduations and paper size markings. Straight blade and short wave blade included. Capability of fitting a further 10 different cutting shaped blades. Premium quality, stylish heavy duty A4 trimmer. Patented luminous presser and rail mechanism holds paper firmly in place to ensure a precise cut. Adjustable magnetic paper gauge holds paper on calibrated metal base. Handy built-in storage area for extra cutting blade and mats. Cutting Capacity - up to 32 sheets of A4-size paper. Premium quality, stylish heavy duty A3 rotary trimmer. Cutting Capacity - up to 32 sheets of A3-size paper. Premium quality, stylish heavy duty A2 rotary trimmer. Patented rail mechanism holds paper firmly in place to ensure a precise cut. Cutting Capacity - up to 20 sheets of A2-size paper.